Sony and Naughty Dog have announced Uncharted 4: A Thief's End will be releasing in March 2016. Find out the exact release date in our story. Uncharted 4: A Thief’s End will launch on March 18, 2016. Sony and Naughty Dog have announced several pre-order editions for the game, which includes two limited editions and a special digital deluxe edition. 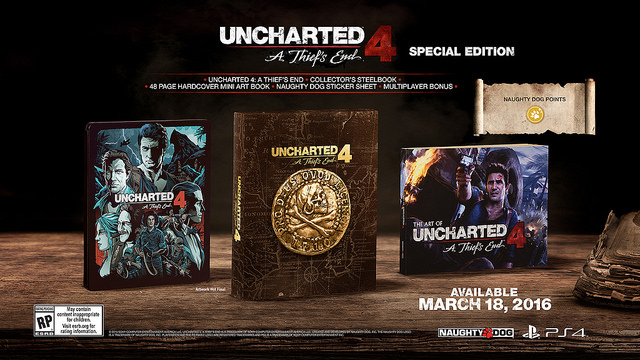 The Uncharted 4: A Thief’s End Special Edition retails for $79.99 and features the game itself, a collectible steelbook case designed by Alexander “That Kid Who Draws” Iaccarino, a 48-page hardcover art book by Dark Horse and Naughty Dog, a Naughty Dog & Pirate Sigil sticker sheet, and Naughty Dog Points that can be used to unlock various multiplayer content. 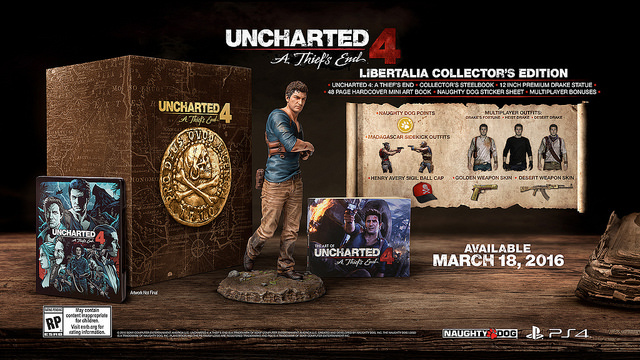 The second collector’s edition is called the Uncharted 4: A Thief’s End Libertalia Collector’s Edition. It retails for $119.99 and includes everything in the Special Edition as well as a 12-inch premium Nathan Drake statue, three multiplayer outfits, two custom weapon skins, a Henry Avery Sigil ball cap, and Madagascar Sidekick outfits. Those who prefer to own Uncharted 4 digitally will be able to purchase the Digital Deluxe Edition from the PlayStation Store, which retails for $79.99. This version comes with a digital copy of the game, instant unlock of two multiplayer customization items, and the Uncharted 4 Triple Pack. The triple pack includes future access to the game’s single-player story add-on and two multiplayer packs. Sony is also offering pre-order bonuses across a variety of retailers. Those who pre-order at GameStop will receive the Multiplayer Booster Pack and the Phurba Dagger Taunt. Amazon pre-orders will net you a Snow Camo weapon customization and Desert Drake outfit multiplayer customization. Finally, pre-orders via the PlayStation Network will get you an Uncharted 4 Dynamic Theme and the Desert Weapon customization. Same ^^^ one of the top most anticipated games for the PS4 for me, I can not wait I loved every video so far it looks crazy good. Same here. It's only a question now if I really need one of these special editions. I'll probably just opt for the game by itself since I was never a big Uncharted multiplayer player. Just a beautiful game :) I can has? So this and possibly FF15 as well in the same month? That would be both amazing and time consuming. Just need a PS4 now. I'll probably just wait for the inevitable Uncharted bundle. If the statue is high quality PVC or that hard resin then I'm in. If its that plastic junk that we got for the Dark Souls 2 collector's edition then I'll be upset.